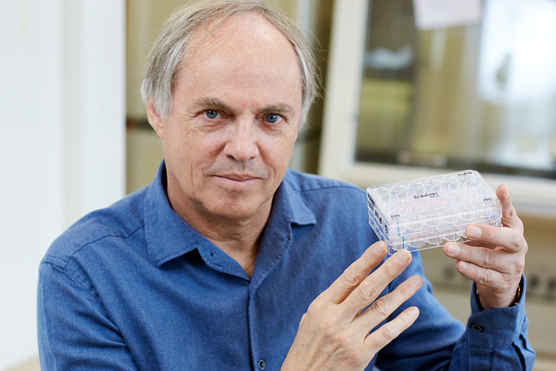 Hans Clevers is genomineerd voor de European Inventor Award (EIA) vanwege zijn organoid techniek. Sinds 2006 is de EIA is een van de meest prestigieuze innovatie prijzen in Europa. Hij is in het leven geroepen om pionierende onderzoekers persoonlijk in de schijnwerpers te zetten, evenals hun maatschappelijk relevante onderzoek. De winnaars worden geselecteerd door een onafhankelijke jury bestaande uit internationale autoriteiten uit de wetenschap, het bedrijfsleven en de politiek. De onderzoekers worden beoordeeld op grond van hun bijdrage aan technische innovatie, sociale ontwikkeling, economische bijdrage en de bijdrage aan werkgelegenheid in Europa. De EIA website schrijft: “Hans Clevers arrived at his breakthrough after a decade of studying the intestinal tract’s remarkable ability for self-repair. The researcher had long suspected intestinal stem cells were key drivers of gut regeneration. He became the world’s first scientist to locate a class of these stem cells, known as LGR5 stem cells, inside glands (or “crypts”) within the intestinal lining. After pioneering a genetic technique to grow LGR5 stem cells in the laboratory, Clevers was able to develop “intestinoids” that could be used to test drugs safely on active human intestinal tissue. A few millimetres in size and grown over the course of ten days, these mini-organs have opened the door to growing other “organoids” in the laboratory, including human brains, livers and kidneys. The main area of impact lies in both pharmaceutical development and personalised medicine. The technique also allows replicas of cancerous tumours, called “tumouroids”, to be grown in order to pretest hundreds of different drug regimens in vitro (outside the human body). The advantages of the patent-protected invention are twofold. Firstly, organoids allow health care providers to test even aggressive courses of treatment – for instance against cancer – without harming the patient. It is estimated that 5% of all hospital admissions in the EU are due to an adverse drug reaction, which could be avoided with organoids. Adverse drug reactions are also the fifth most common cause of hospital death. Secondly, organoids allow for a “personalised medicine” approach to treatment, as they are uniquely matched to the genetic make-up of one patient only. The personalised medicine unlocked by the invention opens a new chapter in pharmaceutical testing, because the current practice of clinical patient trials gauges the effects of drugs only on populations, not on individual patients. Clevers’ invention also enables new forms of cancer therapy by growing replicas of cancerous tumours, called “tumouroids”, to allow the effects of potential therapies to be tested in a safe environment. Furthermore, organoids offer a viable alternative to animal testing in drug research – desirable from an ethical perspective and also because responses to drugs vary significantly between animals and humans. Although only slowly gaining market traction, organoids have the potential to significantly lower both costs and failure rates in drug development. As a current study by Excel Matrix points out, investments of several million euros are necessary to develop a new drug, while only an estimated one in 10 000 chemicals that enter the discovery cycle ever reaches the market. The percentage of late-stage clinical failures – currently at 50% in Phase III – is also rising. Organoids offer “test driving” of new drugs with direct feedback, and thus substantial savings. Bridging the gap between laboratory and clinical practice, Clevers has co-founded two successful spin-off companies: U-BiSys BV in 1996 (now Crucell, a division of Johnson & Johnson) and Semaia Pharmaceuticals GmbH & Co. KG in 2000 (now Hybrigenics SA). Analysts regard organoids as potential game-changers in the world market for 3D cell cultures. While the segment achieved sales of around EUR 560 million in 2014, wider availability of organoids is expected to propel the market to EUR 2 billion by 2019, with a compound annual growth rate of 30%.